Since the dawn of personal electronic gadgetry, humankind has been annoyed by the energy needs of said gadgets. Batteries need replacing and devices power down, usually when you’re completely removed from places of replenishment. Grumble no more, fearless consumer! 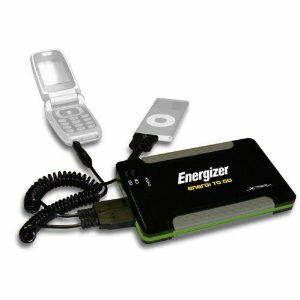 The modern age has provided us with many options for taking the power with us, and the Energizer XP4001 Universal Recharger is a shining example of that portable power! This particular device was recommended to us earlier this year by fellow techie and frequent traveler Wes Brown (blog , Twitter). ‘Tis the season, so I ran right out on the interwebs and purchased one of these power packs (actually I prefer to think of it as my 1up) for me, the hubby, and the mom. It’s fairly straightforward: Charge the recharger, put it in the provided travel baggie, add the appropriate cords and tips (in my case, the iPad cord and the mini USB tip), and wait for the power to die in an inconvenient location. The .5 score deduction is just me bolting back my enthusiasm…we’ve only had these things for two days now. And you’ll notice on Amazon that the 29 reviews rate this device at 4.5 stars as well, and the negative reviews are mostly in relation to the “free tip” offer – if the device doesn’t have the right tip for your phone, each free tip comes iwth a $3.95 shipping and handling charge. POWER (that is portable) TO THE PEOPLE!